Professor of Theology at Brigham Young Academy from 1897 to 1899 and from 1901 to 1902 per Wikipedia Article. Ordained to Quorum of Twelve, Church of Jesus Christ of Latter-Day Saints. Please read the histories, biographies, and other items on this page. Marriage solemnized at the Register Office, Maldon in the district of Maldon in the county of Essex. 5th person down right side. "Julie Penrose, age 15" living with family of William Sexton, Friars Place, St. George, Southwark. Matilda 35, (Indept) Charles 9, Matilda 7, Emma 4. Family lives on St George Row/Road, St. George the Martyr, Southwark. The 1841 Census was taken 6 June 1841 and was the first to list individuals by name and occupation. Matilda Penrose is listed as head of household, marital status is widow. Esther Romania Bunnell Pratt divorced Parley Parker Pratt, Jr. by temple annulment 7 Jun 1880 and also by Civil Divorce Mar 1881 then married Charles W Penrose 11 Mar 1866 in the Endowment House at SLC. 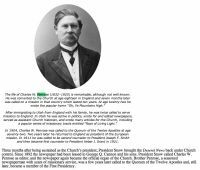 Charles was on a mission to the States and in England returning undercover to SLC 10 Nov 1885. This was taken while Charles was serving as President of the European Mission, 1906-1910. This is probably a photo from his first British Mission 1851-1861. 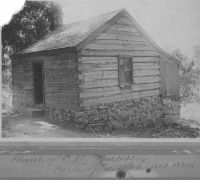 Charles and Lucetta Penrose home in Farmington Utah from 1861 to 1864 - This is where Lucetta lived with a house full of children while Charles spent a lot of time in England on a mission. This may be the portrait he had taken during his 1885 English mission. 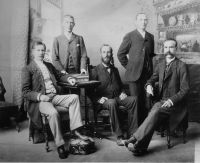 Charles W Penrose, Editor, and his Editorial Staff of the Deseret News in Salt Lake City. 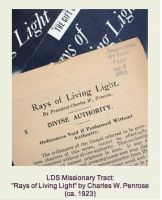 Charles W Penrose was the author of this basic missionary tool - the tract - that was used throughout the world, "Rays of Living Light"
Charles W Penrose in the First Presidency of the Church of Jesus Christ of Latter-Day Saints. He was first counselor. Seated at the head of the table is Heber J. 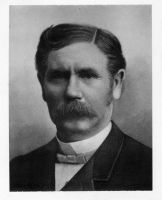 Grant, president of the Church. 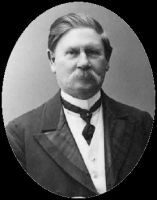 The fellow across from Charles is Anthon H. Lund, second counselor. Charles Penrose in cap and gown. Brigham Young University awarded an honorary "Degree of Doctor of Law" to the 89-year old CWP on May 27, 1921. This photo was taken at an earlier date, place and occasion unknown. A short trip to Camberwell. Penrose Street in the borough of Southwark is in the general area where Charles Penrose was born and raised. Before the 1880s the street appeared on maps as West Street or Hartford Place. Penrose is a Cornish name. Some historians claim that all Penroses came from the same original Penrose family in Cornwall. Prominent 19th Century Penroses included Charles Vinicombe Penrose, a naval hero during the Napoleonic Wars. He died in 1830. One of his nephews was the English poet Matthew Arnold, whose mother was Elizabeth Penrose Arnold. So far there is no direct link between the family of Charles W. Penrose and the naval hero and the poet. In the early 1800s this area was a suburb of London known for its gardens and horticulture. Today this area is a mix of older residences, green parks and modern buildings. Underground station opened in 1890. Matilda Sims Penrose and the Parker family lived near here. 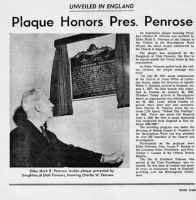 Short article about Charles Penrose as Editor, date unknown. A brief letter written to his daughter Lucile in August 1909. Penrose was president of the European mission and wrote he "had just been on the trip of my life." He mentions Frank, Lucile's husband, and "the Dr." his wife Romania. This is a hymn that is wonderfully dated, springing as it does from the 1857 Utah War, in which the Mormons saw themselves audaciously at war with the United States; and, when it was over, felt that they had, with God's will, been granted some kind of victory. The hymn is sung to the tune of "The Red, White, and Blue." Charles W. Penrose Biography - Click on Next Line. First Counselor in LDS Church Presidency, Editor of the Deseret News, Leader of the LDS Church for Europe and Africa, Lobbyist for Utah Statehood, Polygamist, Poet, Author of Many LDS Church Pamphlets, public speaker. This is a record of LDS Church ordinations and callings and is supplemental to the Chronological History. In February 1983 former Deseret News editor Charles Penrose was added to the list of illustrious journalists in the Utah Press Association Newspaper Hall of Fame. Click on the S7147 to see the induction papers.